Swarovski Siku Polar Bear and Cubs: Coke or Pepsi? The Coca Cola – Pepsi wars have been raging for years. In 1993, Coke launched its Coca Cola Northern Lights commercial. It was a parody of bears going to a drive in theatre, viewing the Northern lights. All the polar bears were enjoying their Coca Cola. I recently decided to check in with Swarovski Siku and her Swarovski Polar Bear Cubs. 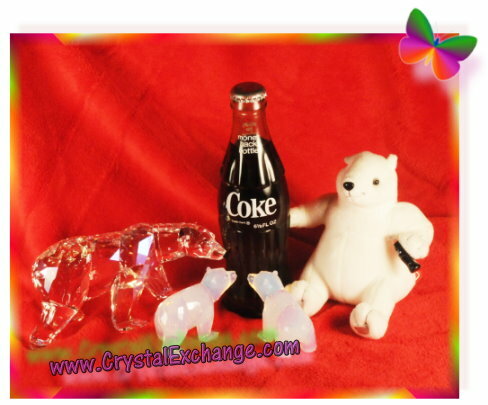 My question….do these Swarovski polar bears prefer Coke or Pepsi? Here’s their reaction to Pepsi…. While the Swarovski Polar Bear may be a bit interested in Pepsi, it is clear that Siku and her Cubs are not interested. All appear to have shrugged their shoulders and are walking away from Pepsi. Here’s their reaction to Coke…. The Coca Cola Bear to the right is sharing his Coke with Siku and her Cubs. They all seem quite interested to quench their thirst with Coke. It seems obvious enough to me….Swarovski Siku and her Swarovski Polar Bear Cubs prefer Coke. 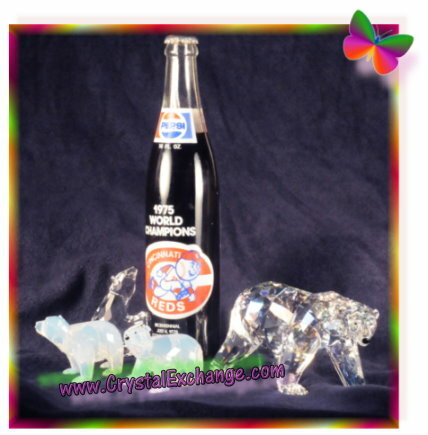 Swarovski Polar Bear – (Pepsi photo only) Silver Crystal figurine produced from 1986 to 1997. Secondary market pricing is $150 – $275. The crystal brand also produced the Swarovski Nanuc Polar Bear from 2005 to 2008. Secondary market pricing is $425 to $500. The Nanuc Polar Bear is not included in the photos. There are LOTs of Coke and Pepsi commercials on YouTube if you want to walk down memory lane viewing them.